It sounds obvious, but a candidate relationship management software should ultimately make it easier to manage relationships with candidates. This is why a CRM software is different from an applicant tracking software (ATS), because an ATS is focused more on the application process itself and not necessarily on relationship building. Building and maintaining relationships with candidates is what will give your company an edge over the competition. Having a familiarity with your employer brand as well as a few regular touchpoints will keep candidates interested and intrigued by your latest job openings. A key part of relationship building is staying in touch. In recruiting, the best way to stay in touch with candidates is via a talent pool. 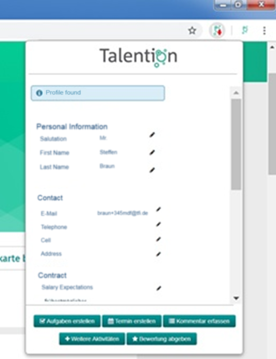 With a talent pool, you can can keep in touch with not only applicants, but also those who are interested in your company but couldn’t find a related position to apply for. 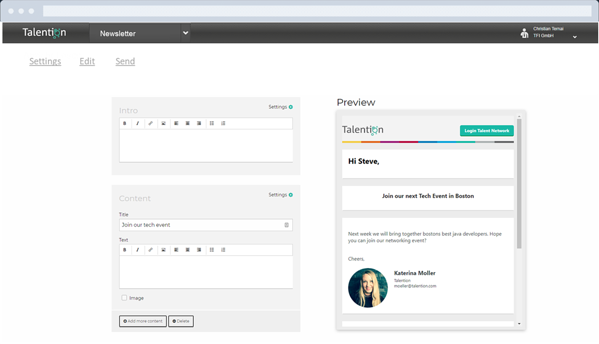 Via a software you can integrate your talent pool into your career page and job ads via pop-ups. You can also easily take your talent pool on the go to make sure you don’t miss out on potential candidates at events and job fairs. Once you’ve got candidates in your talent pool, you need to create touchpoints to stay relevant with them. Nurturing email campaigns will save both time and effort. With a CRM recruiting software you can set-up these email campaigns to be sent to automatically to those in your talent pool. Having an effective email campaign that is sent out over time, like a monthly newsletter, will keep your company at the forefront of the candidates mind. Being able to source passive candidates and build strong relationships with them can be a gold mine for future openings. Even if passive candidates aren’t currently looking for a position, by keeping in regular contact with them your company will have the advantage when they begin to look for something new. Recruiting software that has a sourcing tool will help immensely in finding passive candidates, contacting them, and obtaining their information. Employer branding is the glue in a candidate/employer relationship. It’s the reason why candidates are interested in your company and what sets you apart from other companies. Having a CRM recruiting software will help with various aspects of your employer brand. For example, it can help to ensure that your brand is accurately portrayed and visible on your career page and job ads. The best relationships are ones that are mutually beneficial for both parties. That means your candidates are looking for a positive and enriching experience, one that they won’t forget anytime soon. And in today’s competitive job market, candidates expect the best. A CRM recruiting software will bring their candidate experience to the next level. From specific landing pages with content created especially for individual target groups to easy to fill out application forms, a CRM software is focused on creating the best possible experience. Looking for a recruiting software that’s focused on CRM? Would you like to learn more about CRM focused recruiting software? We will gladly show you further best practice examples and how you can implement CRM strategies with the Talention software. You can request a demo here and someone will get in touch with you shortly. Request a demo now.